Through our time of making Ketubahs for awesome couples, we’ve met quite a few couples that met online! We love hearing their stories because, well… we just love hearing how two people meet, fall in love and spend forever together. Naomi and Darren were no different. eHarmony must have made a great match because next thing you know — we have the pleasure of creating their awesome Ketubah! Naomi told us all about some of the fun and crazy things they like to do together, like doing the Color Run or going to Monkeyland. She also told us about her beautifully romantic proposal — set at a fancy restaurant that of friend of theirs manages. Residing in New York, it seemed only fitting that Naomi and Darren wanted the Subway Print No. 1 Ketubah. A Haring Inspired print, this Ketubah definitely contains the urban feel of a big city. And knowing more of Naomi and Darren, we think it’s the perfect fit! So we had to know — what was their favorite part of the big day? We didn’t have a traditional sit-down dinner. Instead we did a buffet and people could sit where ever they liked and with whomever they liked throughout the venue. We also had a photobooth, perhaps not unique but definitely a big hit. Well their wedding looked absolutely stunning. And we love the idea of having a photobooth! To finish off, Naomi filled us in a little bit about their Honeymoon destination, that didn’t include just one place, but TWO! Part 1 Punta Cana, Dominican Republic (it was February) Part 2 is coming up in about a month, Ireland. 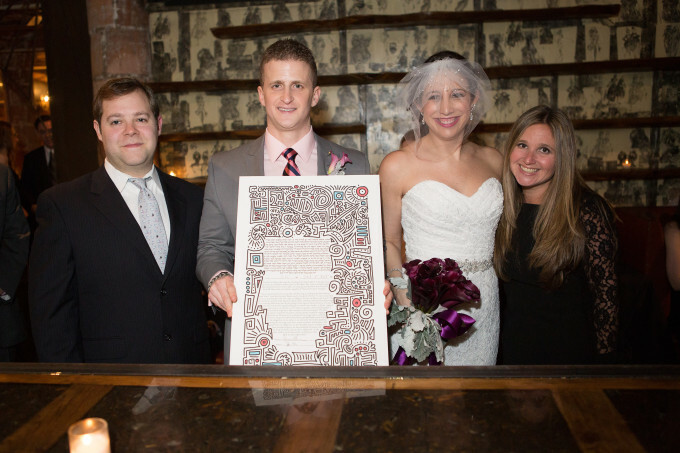 From Team Ketubah to Naomi and Darren — Mazel Tov again on your big day! You were both such a pleasure to work with and we feel so honored that we were able to create something so important and meaningful for your wedding. We wish you both a lifetime of adventure, laughter, and love!